I have written before about how important I believe it is to love where you live. I didn't go into too many personal details in that blog post so I thought I might give my readers from all around the country, and the world, some insight into my town and why I love it so much here. So, because the Internet loves list, I thought I would share with you the 5 reasons I love Asheville so much. 1. The mountains. Some people love the beach. Some people love the city. I love the mountains. 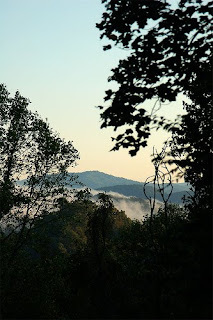 There is a sense serenity I get from just being close to the Appalachians. Growing up I had no idea that a place on this planet could make me feel as peaceful and as happy as my little patch of the mountains. When I'm driving back to Asheville from Michigan, for instance, I don't really breathe again until I reach Tennessee and my mountains greet me again. 2. I chose it, or it chose me. I was born in Michigan - that was a circumstance. I moved to Atlanta - that was an opportunity. Asheville was a choice. It was the first time in my entire life that I felt in complete control over the place where I loved. This might be a cop out reason because there are so many actual reasons for loving Asheville, but feeling as though we both chose to be part of this reciprocal relationship is gratifying. 3. Beer. I would be remiss if I didn't include beer in my list of things I love about Asheville. Before moving to this town I had zero appreciation for beer culture. I tried my first craft beer at a bar downtown and it suddenly opened up a world of flavors. I had no idea what I was missing. Learning to enjoy beer has lead to a number of opportunities including my blog as well as getting a part time job at my favorite laundromat/bar! 4. Big small town. Asheville is a town of only about 80,000 people. Its geography is contained in a valley which helps to keep the physical borders of the city limited. I love this about Asheville. When I was in Atlanta I would often get so tragically lost that it was all I could do not to pull over and cry. For about two years I took a long way home because I had no idea that a shorter way existed. Traffic was horrible. There is no rush hour to speak of in this town. I love that I can find my way around even without knowing exactly where I need to be. 5. People. Don't get me wrong. I have friends in Michigan who are still dear to me. The same is very true for Atlanta. I have friends all over this country - from DC to Hawaii and everything in between - who I care about very much. But I also crave a community. I love daily connections. I like to go out and sit at the bar and talk to strangers. I love to have conversations with people who have different views from me. I can do this from anywhere, but Asheville seems particularly open to face to face communications. These are just five of the reasons I love my city. I also love that there is an environmental consciousness that makes it a perfect place to live in a tiny house. I love that all four seasons are well represented here. I love that I can walk a lot and don't have to drive as much. I love that so many artistic people live here. I can go on and on and on. Hey, don't forget that I wrote a book. Check out the links at the top and side for information on buying the paperback or kindle editions! I'm so happy that you've found your perfect happy place. Currently, I'm not living in such a place. I'm living in a big, sprawling suburban patch of ugly. But it's necessary right now, but probably won't always be this way. I hope. I know lots of places I'd be very happy to live in, but they are all too expensive in terms of housing. Which is how I became fascinated with tiny homes. Because if I want to live in any of my half dozen dream locales, living tiny might be the only way. "I was born in Michigan - that was a circumstance." Really good point. I have lived in Adelaide, South Australia, all my life. Sure, I have moved around the suburbs a bit and I lived in the city centre for a while. But it's the same place. It's where I was born and raised and have held a career. I'm ready to choose a place to live. I was wondering where I would like to live, and Logan County, Virginia, snagged me. It chose me, and I'm going along willingly. Asheville is home for me but circumstances have me in Tn. I'll take your 5 reasons to love Asheville and add a dozen more. It is the only place on earth I feel real peace all the way down deep in my soul I still have 23 acres there and the frame of a tiny home in the works. I plan to spend all my weekends there as soon as I can get it finished. Asheville is home for me but circumstances find me in Tn, just the other side of the mountain. Asheville is the only place on earth I feel truly at peace. I have 23 acres there and the frame built of a tiny house. Can't wait till I can afford to finish her and spend more time there. It will be my weekend home.